Come along and have a chat with the team, have an interview, complete all of your recruitment paperwork and leave with a provisional job offer and the excitement of joining our family! Don't worry if you can't make this date, we can arrange for you to be interviewed on an alternative date. We are looking for enthusiastic, flexible and highly motivated Radiographers to join our very busy Radiology team here at The Shrewsbury and Telford Hospital NHS Trust. The successful applicants must have a BSc (Hon) Diagnostic Radiography or DCR and have current HCPC registration. These posts would be suitable for newly qualified or experienced Radiographers who would be provided with the opportunity to develop their skills. The successful applicants would be expected to participate in a busy general rotation including cross sectional imaging, participation in the on-call rota and 7 day working. 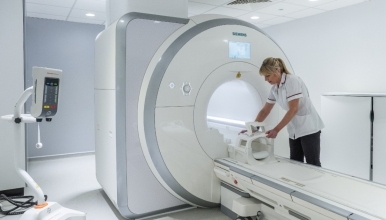 In 2017 we opened our new Siemens Magnetom Aera MRI scanner and we are currently in the process of replacing all of our current imaging equipment to DR. This includes the installation of a state of the art Cath Lab and an additional CT scanner at The Princess Royal Hospital site. All Radiographers with more than 1 year Post Graduate experience contribute to the training and mentor-ship of undergraduate students and the department has an excellent on site teaching environment. The department is fully committed to role extension and has practising Radiographers undertaking Ultrasound, Barium Swallows, CT Colonoscopies, CT head and plain film reporting. We are committed to the development of our teams, including extension into advanced practice, under the guidance of our Consultant Radiographer - striving to provide quality imaging for our patients. The Shrewsbury and Telford Hospital NHS Trust is the main provider of acute medical care for half a million people in Shropshire, Telford & Wrekin and mid-Wales and has been awarded over £300 million to invest in our hospitals.